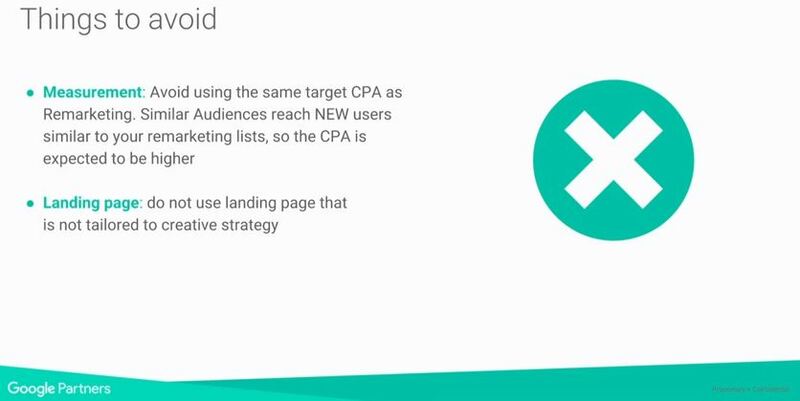 In a recent Google Academy on Air presentation, businesses managing AdWords campaigns learned how to find new, qualified users, called similar audiences to increase their click-through-rate (CTR) and conversions. These are audiences who have the same characteristics as your customers, those who have recently completed a conversion on your website after clicking on a paid ad. 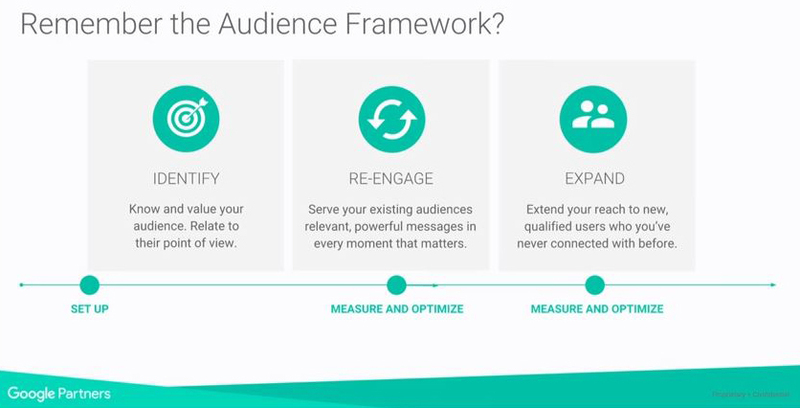 Google first lays out the audience framework, the process for setting up the similar audiences feature on your AdWords campaign. In previous presentations, Google had discussed the previous 2 of the 3 steps, Identify and Re-Engage for how you can find potential customers and drive them to take action after clicking on your ad. 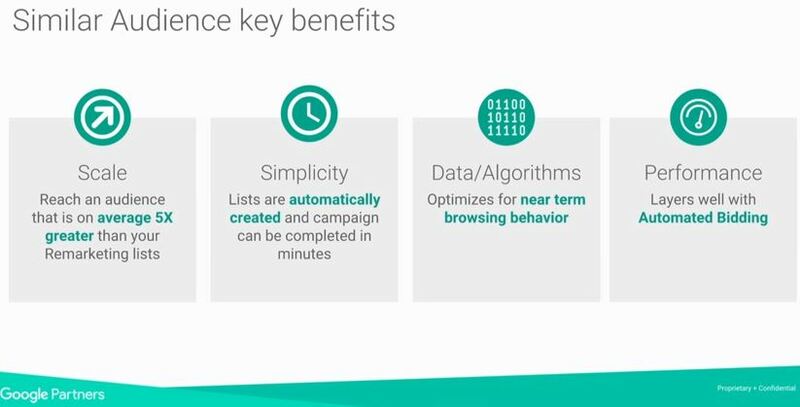 In this presentation, Google will be focusing on the third step, Expand, that will allow you to extend your reach to additional qualified users who have never interacted with you before. 96% of people who visit website without taking any action. 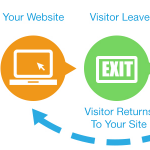 84% of people on remarketing lists will be re-served within a month. In Google’s marketing funnel, similar audiences plays a big part in influencing consideration. With similar audiences, you will be able to find new audiences who share characteristics with your website visitors. After showing interest and clicking on your ad, you will then be able to drive action and grow loyalty from them. 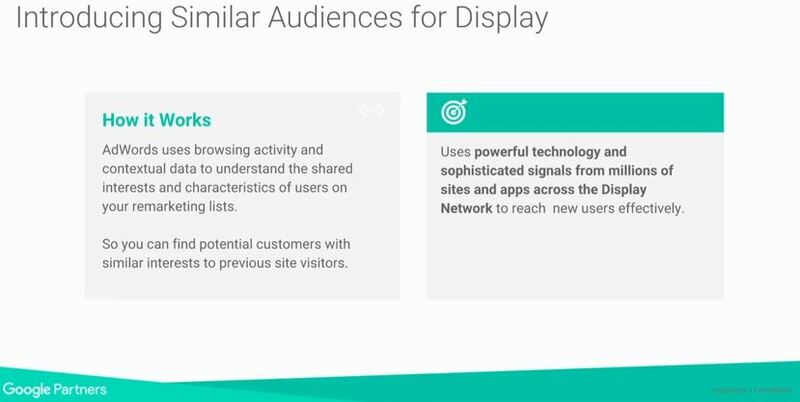 So within your remarketing lists, Google will choose new users who “look” like them, thus, developing your similar audiences list. This in turn leads to more qualified users coming through the door, allowing you to drive reach while focusing on efficiency. 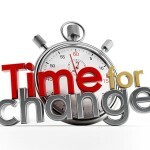 Similar audiences all start by creating and implementing remarketing lists. As this list grows over time, the similar audiences feature will automatically generate lists. This will include completely new users that will not overlap with the data included within the remarketing lists. While these benefits are indeed nice to have, they will only be beneficial when similar audiences are understood and implemented properly. So Google provided the example of a department store using a gold rewards program. Gold rewards users are high-value customers for the store, coming in every few weeks to buy a new suit, pair of shoes, or pants. The department will then take the list of gold rewards members and analyze various factors, including purchase intent, demographics, interests, time and geography, using machine learning. The list is then generated with users who have the same characteristics as the users in the remarketing lists. Another advantage of similar audience lists is that you can use any remarketing lists from your campaign. Whether you want to include all users who have visited your site or all users who made a purchase from your site, you can choose with to your similar audience lists will be most likely be similar. Information from users who have visited your website is stored on Google Analytics. These users are added to Remarketing Lists for Search Ads (RLSA), depending on your preferences. Users added to this list search on Google before or after being included on your RLSA list. Google compares this user with others who are not on remarketing list, but adds them to a similar audiences list instead. The similar audiences for Search are ready to be added to your Search campaign. 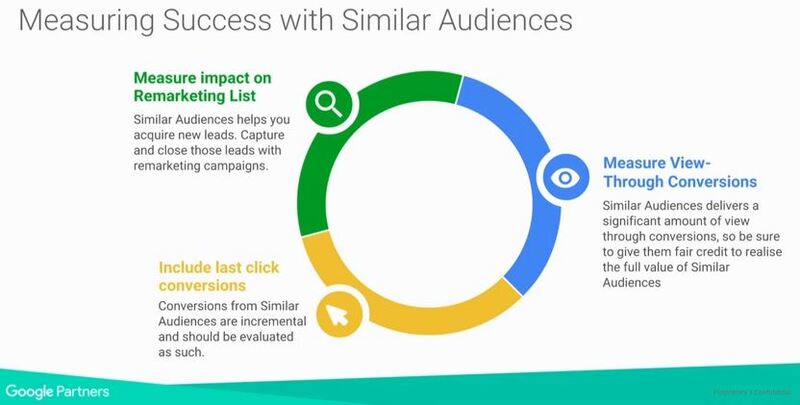 Important tip: To get the most out of your similar audiences lists, be sure to take the steps below that include the best practices and implementation. Implement remarketing tag. Make sure there is one on every page of your website. Ensure similar audiences lists have accrued enough data. It usually takes up to 48 hours for similar audience lists to be created. Identify converters and purchasers. Use your lower-funnel remarketing lists (converters, purchasers) to expand to your similar audience lists. Layer your lists. Add your similar audience lists to all Search and Shopping campaigns using “bid only” setting to ensure your are providing sufficient audience signals to your advantage. Enhance similar audiences with smart bidding. But if you prefer manual bidding, start with a 20% bid adjustment for similar audiences. You can then tweak it according to the performance data over time. Campaign structure. Apply similar audience to a new campaign or ad group within an existing campaign. Bidding. Use automated bidding for better performance results. Creative. Use responsive ads with a different messaging relevant to your prospecting audience. Ensure your remarketing tag is implemented on every page of your website. Start your similar audience campaign by using your best performing lists – lower funnel ones (converters and purchasers). If you’re already curating a business feed for your Shopping or Dynamic Remarketing campaigns, ensure to attach your similar audiences campaign to show dynamic ads to new potential customers. Fiat Chrysler: 22% more conversions on Search campaigns. Cheap Caribbean: 250% increase in click-through-rate (CTR) and 20% increase in all non-brand transactions. Zoot: 2x higher ROI than other prospecting display campaigns, 3x higher CTR than other display campaigns, and 63% news sessions. While it has been proven that similar audiences lists can drive traffic and conversions after set up and implemented properly, Google covered a lot of information that can be technical for many businesses. These campaigns can also take time to set up and monitor, something that many organizations don’t have due to their daily operations. In these cases, it would be best to allow a professional to take care of this task for you. 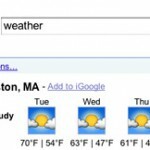 In fact, Google partners with numerous businesses around the world to offer additional help with AdWords campaigns. One such partner includes Proceed Innovative, an internet marketing agency that not only specializes in pay-per-click, but search engine optimization (SEO), and web design. Our digital marketing experts are constantly setting up and updating campaigns after analyzing real-time data to maximize efficiency and conversions. In addition to our years of experience, we also attend frequent training sessions to stay on top of the latest trends and products released by Google. And after analyzing your audiences, traffic, and budget, we can add a similar audience list to your campaign, delivering results similar to the brands mentioned above. Give us a call at (800) 933-2402 or fill out a contact form for more information or a free estimate on how we can help you take advantage of similar audiences. We look forward to working with you soon!